Native live Oaks in a natural setting with the Pop Ash Creek adding to the serene landscape. Comfort of full RV hook-ups. 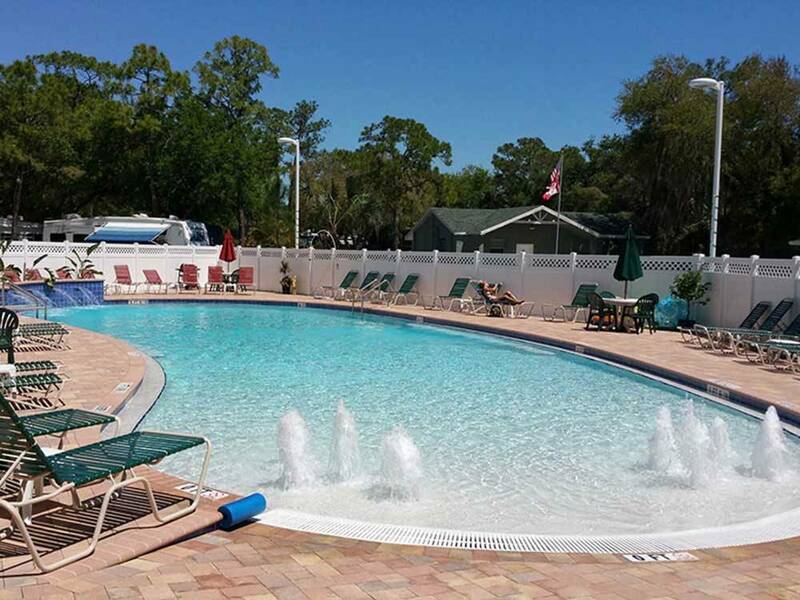 Heated pool & free Wi-Fi. A peaceful getaway but close enough to enjoy the Gulf beaches. We called at the last minute 2/10/17 to get a week starting 2/21 thru 2/27 so was not surprised to be put in the "overflow" area in the back. That actually was a good thing as there was plenty of room on each side of our 25 ft. class C. The weekly rate we paid was $425 with Good Sam Discount. We were glad to find an opening anywhere as most CG's are booked up way ahead. We noticed that all the regular sites were all very close to each other. Lots of seasonal people. We had to disconnect the toad before the park worker helped us get backed in. Very nice people. Pool was great. We used the laundry room with no problems (watch the dryer setting). Rest rooms and showers are across the road from the pool were excellent. Wi-Fi was pretty good, even in the overflow area. We were able to get HD stations from Ft. Myers. Because we were in the "overflow" we did not get the usual daily trash and recyclables pick up, but we just walked down to them ourselves when we walked the dog. Actually the overflow area was very quiet. They must rent out some of the spaces for people to store motorhomes. One next to us never had anyone in it. Hook up for water & electric was at the back of our site, but was not a problem as we have long power cord and our water/sewer connections are at the back of the unit. My only grief was the pine trees. Pine cones, crud and sap droppings from them on the awnings (1 full size, 2 slide-outs). Took me a while to clean up when we got home. Very easy to get anywhere as park is close to I-75. Main road goes straight west to Pine Island and St. James City. Easy to get to Fort Myers for the Edison and Ford Estates. We also went to Sarasota, Ft. Myers Beach and Sanibel Island (Use Google Maps for routing with the least traffic though the toll-bridge is always backed up.) Lots of shopping, not too far away from the camp-ground. 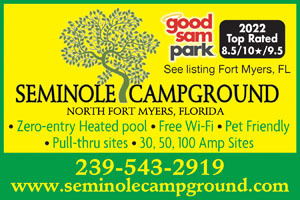 Seminole is a well-run campground. The owner is steadily making improvements. The new (late 2015) pool is large and beautiful. Each campsite has a concrete area for the picnic table. The sites are level and gravel. The trees are plentiful making it feel like a state park. The staff are friendly and accommodating. Like many campgrounds in the area, many of the sites are close. The campground is close to I-75.